Stated Income Loans – No Income Verification for Approval! Call Now For Fast Approval! Stated income mortgage lenders are making it possible for borrowers to loan up to $3 million without proof of income. The minimum loan amount for stated income loans is $125,000. Stated income mortgage lenders usually require a good credit score [FICO over 600] and a 30% down payment, but part of the down payment can be borrowed from the seller or from a family member. Interest rates for stated income home loans are slightly higher than conventional market rates, typically between 7% – 9%, however, a borrower can choose to refinance after 3 years into a conventional loan without any prepay penalty. 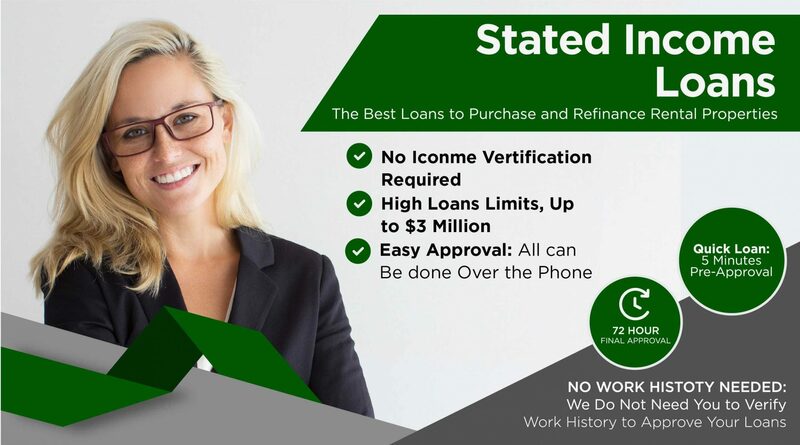 Loan Up To $3 MillionCall Now For Fast Approval! If stated income loan is not for you, you may want to consider an asset based mortgage loan. With this loan, an asset based mortgage lenders will be able to lend you a loan if the value of your assets are high enough to secure the loan. Since the loan is asset based, you do not have to provide income verification, tax returns, or any other employer records. A stated income loan does not have the same underwriting guidelines and delays as a verified income loan. A stated loan can usually be approved and funded within a very short period of time. A stated income mortgage offers a fixed interest rate for the first 3 years. After 3 years, the interest rate varies, and there is no penalty for refinancing into another loan. For borrowers who cannot prove consistent income, or do not show a lot of income on their tax returns, stated income mortgage loans provide a solution to qualify for a loan without the red tape and the frustration of a long underwriting process and the hassles of income verification. For business owners or self-employed borrowers working with cash, stated income loans self employed guidelines make it much easier to qualify for a loan. For stated income loans California borrowing guidelines make it possible for the seller to carry back part of the loan and allow borrowers to purchase a home for up to $3,000,000 [three million dollars]. A family member or friend can also contribute part of the down payment for stated home loans. A borrower with 30% saved can now afford to buy a house up to $3 million with a stated income home loan, without having to provide tax returns, bank statements, and pay stubs. Now is a great time to buy a home! Prices are still rising, interest rates are still low, inventory is still looking good, and with a stated income loan programs, all it takes is a good down payment to qualify for the home of your dreams. Call today for your quick stated income loan approval!